After years of research and performing, Perseus Arkomanis brings you the ultimate sleeving technique. A masterclass to the fastest and most invisible sleeving technique there is! With LIGHTSPEED you will be able to do what most magicians only dream of! "Coins through Hanky" where 3 coins pass through a Table napkin held by two spectators! "Coin Smash" where you borrow a coin and smash it to a table or in your hand to create change! "Smash Undone" where you take the change you just created, put them in your hand and mold them back to the original coin! 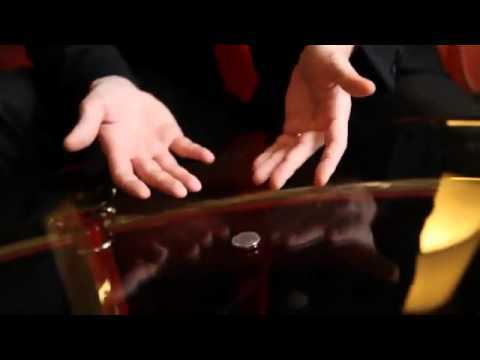 "Simple Coin Vanish" where you just hold a coin and close your fingers around it and it vanishes! "The Strike Banish" A great take on David Williamsons' "Strike Vanish" where you end up clean! "Spoon forking" A switch of a spoon to a fork while acting as if you're going to bend it! "Spoon writing" A wonderful gag where you give a spoon to a spectator to sign a card and change it into a pen when you realize the mistake! "Pen to Pen Switch" For all the mentalists out there that want their double-writing routine to have the two writings be completely different! In depth analysis of the psychology and mechanics of sleeving! CAN BE DONE WITH ANY KIND OF SLEEVE!!! If you really want to take your magic to a whole new level you better start sleeving stuff! For more magic by Arkomanis Perseus click here.